I've been going through the reference shelves at the Reader office (yes, occasionally we use real books for reference) and I've found lots of old, interesting guidebooks to the city. Surely they're out of date and practically useless, I think. But then again, maybe not. Maybe some things are timeless. Maybe some things never change—or just don't change much. It may not look like it, but Uptown is another lakefront community that has been transformed by urban renewal—by the urban renewal that took place elsewhere, that is, which displaced thousands upon thousands of low-income people. A great many of them ended up here, in the dilapidated apartment buildings and residential hotels that crown the side streets around Broadway between Irving Park and Foster, where rents are low and landlords are absentee, where the huge old apartments can be shared with relatives and friends and nobody will be the wiser, where the neighbors are likely to be blacks, American Indians, Puerto Ricans, Philippinos, Indians, Pakistanis, ex-coal miners from Appalachia, winos, junkies . . . you name it. Anything and everything goes in Uptown. 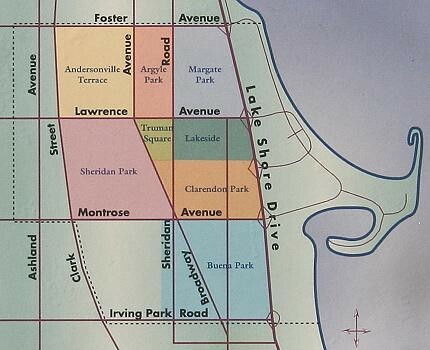 It's entirely typical of Chicago that just to the west of this teeming human stewpot are several blocks of fine old homes bordered by Marine Drive and Sheridan Road, "the Miami Beach of the Midwest." From Balmoral to Devon, balcony-to-balcony highrises effectively wall off the lake. More of these neighborhood nuggets to come on the Bleader. A former employee speaks with the store’s proprietors, Ronda Pilon and Bob Roschke, about the shuttering of their long-standing bookstore. A novel set in early-80s Lakeview goes heavy on the Kodachrome.